This new curriculum guide provides educators of young learners with 60 sequenced hours of standards-aligned lesson plans in robotics, coding, and computational thinking. 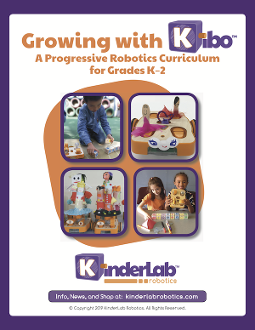 Growing with KIBO - A Progressive Robotics Curriculum for Grades K-2 was designed to support early elementary classrooms with a complete, sequenced STEAM curriculum covering robotics, coding, and computational thinking - in addition to providing opportunities for integrating these topics with arts and literacy activities. Growing with KIBO provides educators with a complete, sequenced curriculum covering robotics, coding, and computational thinking. Each level of this curriculum — Novice, Intermediate, and Advanced — contains 20 hours of classroom lesson plans (for a total of 60 hours), providing a complete K–2 robotics progression aligned to current and evolving computer science standards. Contextualized STEAM projects and a focus on social-emotional development allow students to develop digital fluency, as they collaborate, connect, and express themselves creatively.